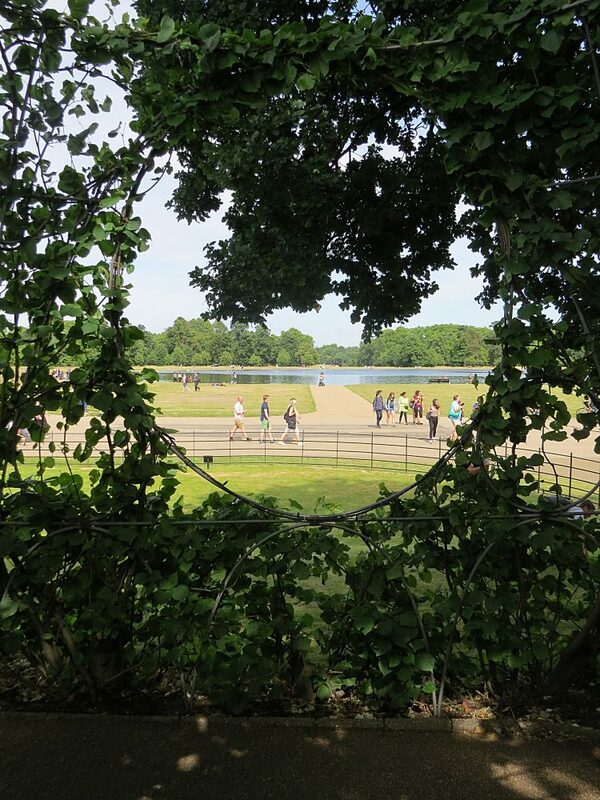 Kensington Gardens and Hyde Park 2 – A (Royal) Breath of Fresh Air……. Gardens inevitably reflect the times and wishes of the people who commission and design them and altering or restoring an historical garden presents a problem. To what period and to what extent do you reinstate it, particularly when it has had many owners and been designed in differing styles? 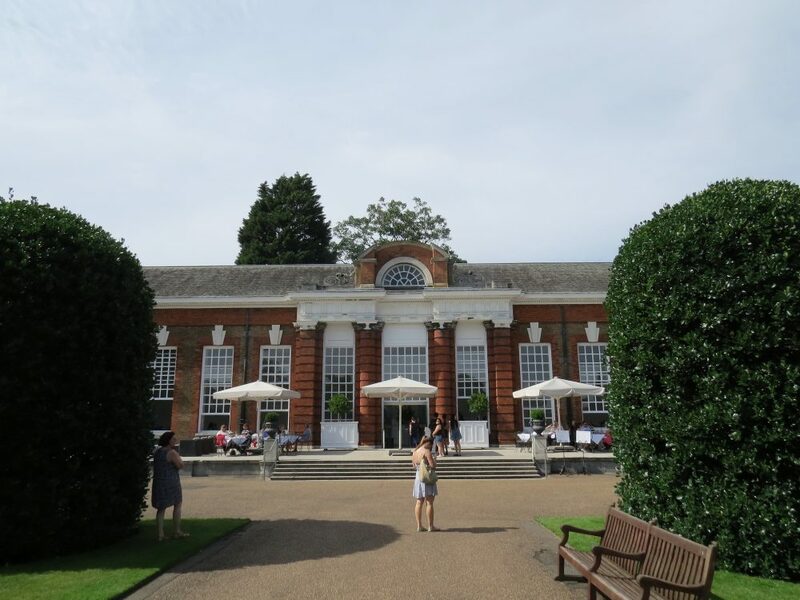 Furthermore, it requires unending patience to get agreement between all the interested parties – the statutory bodies, historical and amenity societies and residents’ groups, particularly in such a highly sensitive location as Kensington Gardens. To negotiate this minefield, and successfully restore a garden using both historical precedents and great imagination is a great credit to both the Historic Royal Palaces and their Garden Advisor (and in this case designer) Todd Longstaffe-Gowan. 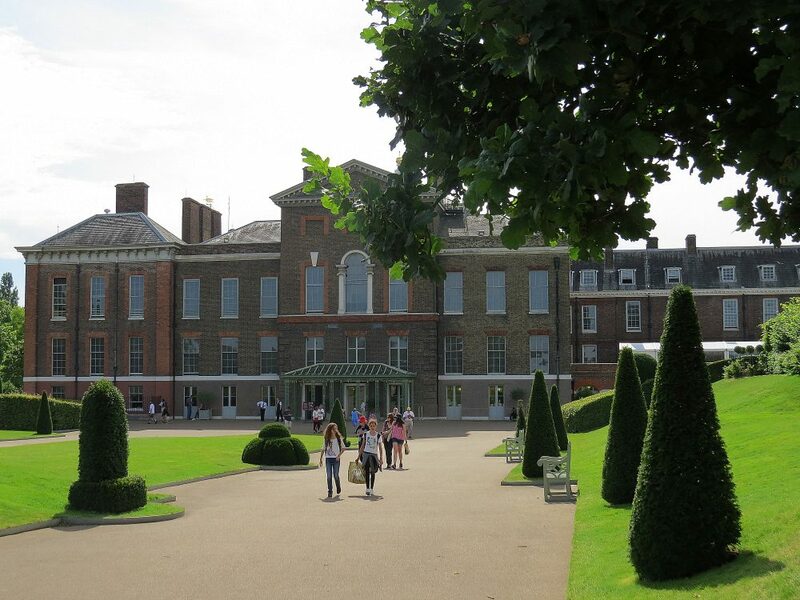 During the time when Princess Diana lived at Kensington Palace, between 1981 and her untimely death in 1997, the public were permitted to view the state rooms through a side entrance, and the lawn area to the east front of the palace was shut off from Kensington Gardens by a high hedge, in front of which was stranded a white marble statue of Queen Victoria. The message was clear that the palace was a private royal residence to which the public were given limited access. It has been claimed, and I think rightly, that Diana’s human touch broke the mould of royal stuffiness and showed how royalty could relate to the people in a way that was more appropriate to our time, a sensitivity that Prince William and Prince Harry have inherited from their mother. 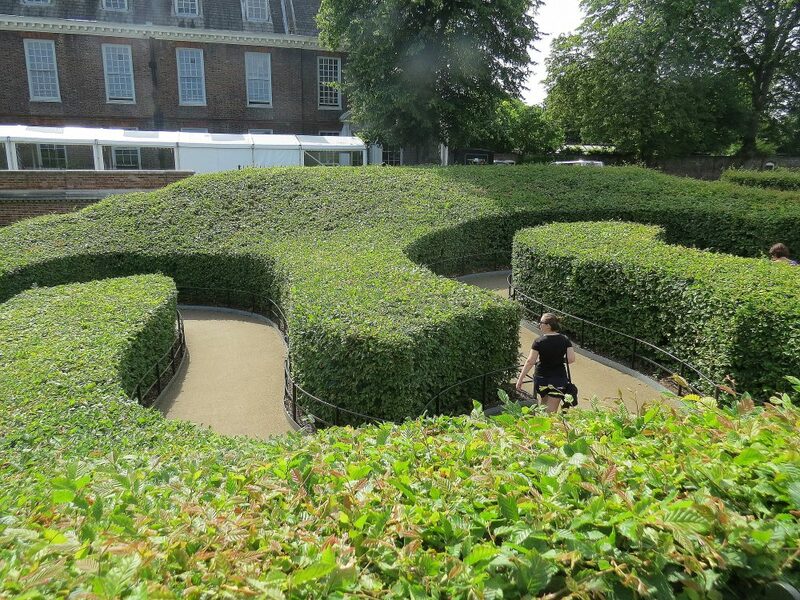 To celebrate the Diamond Jubilee of the Queen in 2013, the gardens at Kensington Palace were re-envisaged and a new sense of openness prevails. Kensington Palace was built for William III and Queen Mary by Sir Christopher Wren with the main façade and formal Dutch gardens facing towards the south. William and Mary’s successor, Queen Anne, swept these away and annexed 30 acres of the adjacent Hyde Park. Henry Wise and George Loudon were asked to lay out an English style garden, but this was to suffer a similar fate – all that remains are the giant holly and bay clipped ‘pepperpots’ which lead to the wonderful Orangery with its palace-style front, designed for her by Sir John Vanbrugh. By 1728 Queen Caroline, wife of George II, resolved to transform 300 acres of Hyde Park into a newly fashionable English Landscape Garden. Charles Bridgeman was appointed and the design was centred on the east, rather than the south front of the palace, overlooking the park. Bridgeman is today under-rated as a designer, eclipsed by William Kent and Capability Brown, but at Kensington Gardens he created the Round Pond, with avenues of trees radiating out like the spokes of a wheel and the naturalistic Long Water (and later the Serpentine), by damming the Westbourne River. Longstaffe-Gowan’s new layout of the East Garden follows the original 18th design reconnecting the palace with the landscape park; the white marble statue of Queen Victoria, now placed as a focal point in the centre of a round pond rather than stranded in front of a high hedge. 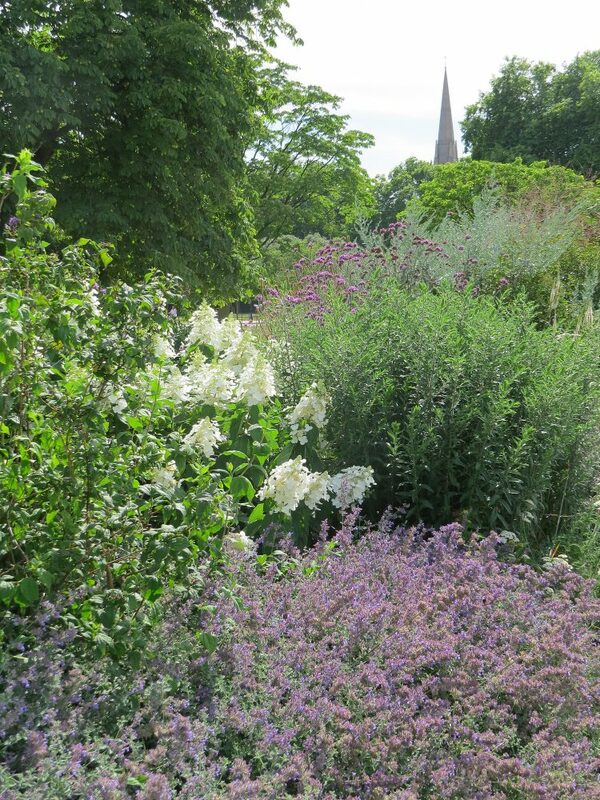 To the south side he has created a long perennial border which enlivens and contrasts with the minimalist formal topiary and lawns situated immediately next to the palace. 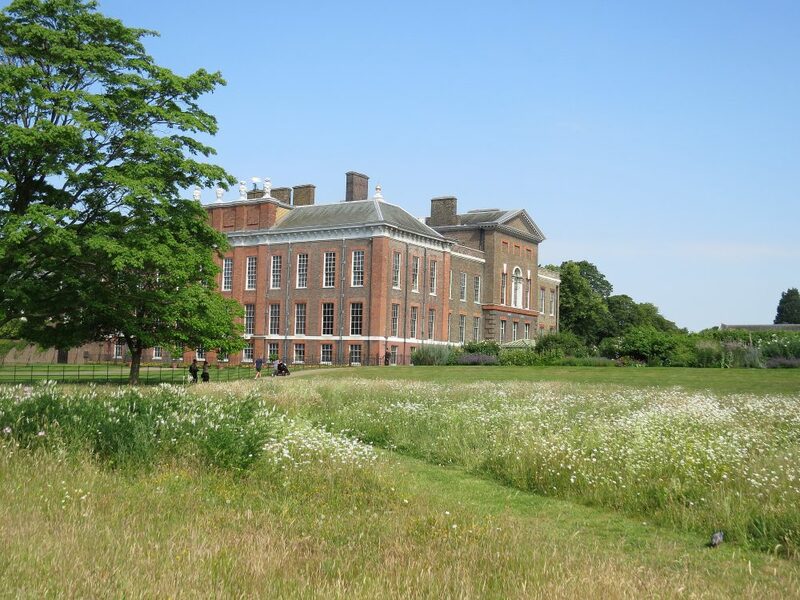 Behind the perennial border, on the approach to the palace from Kensington Gore, he has introduced a wildflower meadow with mown meandering paths. The most significant innovation in his design is the ‘Wiggly Walk’ a snaking ramped access that leads from the lower East Garden and its new café through large blocks of clipped hornbeam up a shallow incline. For the first time the various disparate parts of the garden are joined together but in an unusual and innovative way. 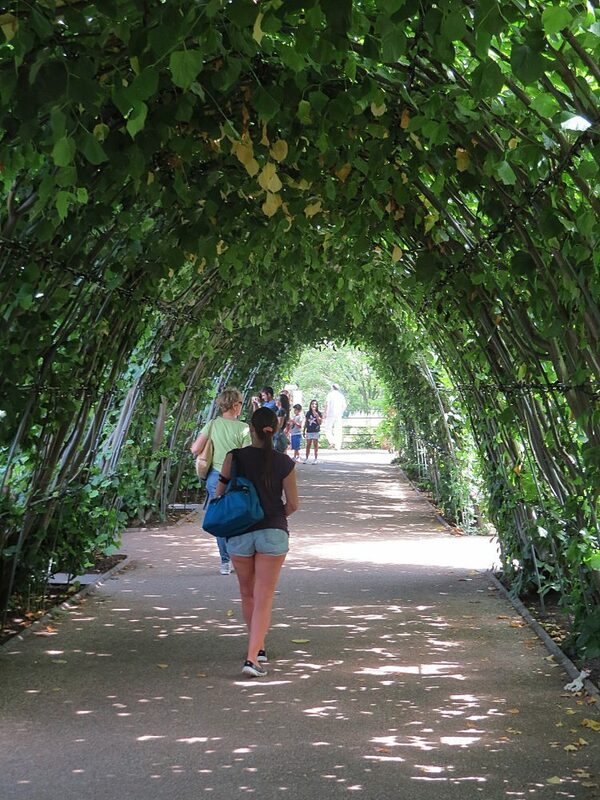 At the top of the ‘Wiggly Walk’ can be found the Cradle Walk, an arched arbour running around three sides of the Sunken Garden. 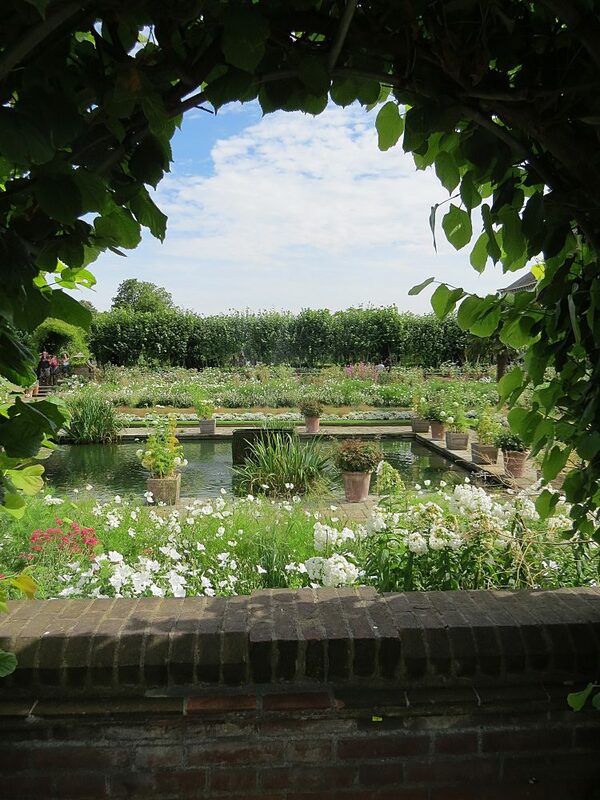 Red twigged limes have been cut to the ground and the new shoots trained over the framework of the bower, whilst arched and oval window openings giving tantalising glimpses of the Sunken and East Gardens and the Round Pond. The Sunken Garden was formerly the site of potting sheds, and in 1908 it was transformed into a tranquil ornamental garden without public access, which makes it all the more enticing. It has a rectangular central pond with fountains placed in three 18th century decorative lead cisterns, surrounding which are ornamental beds at a lower and higher level. It is known for its twice-annual planting of tens of thousands of bulbs, annuals and perennials in many varieties, but in 2017 the vibrant colours and exotic planting were replaced by a white colour scheme in commemoration of the 20th anniversary of Princess Diana’s death. 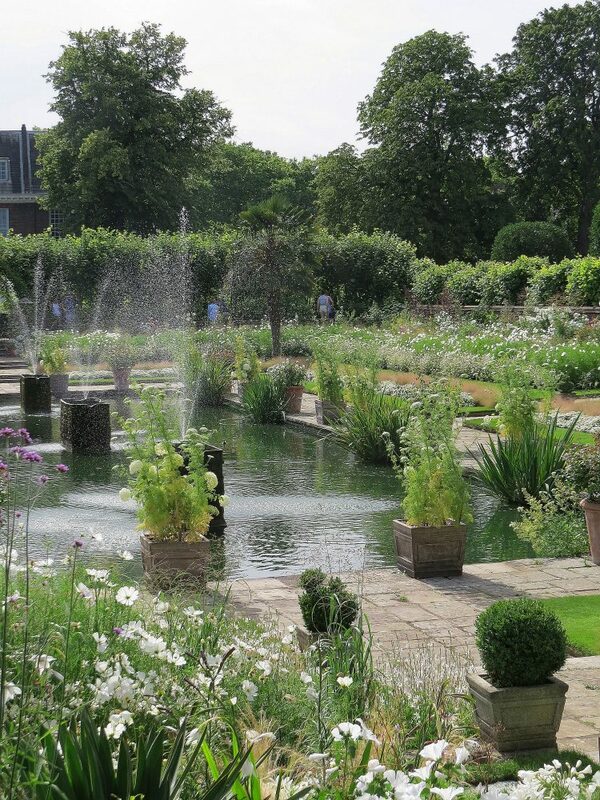 Kensington Gardens as one of central London’s green lungs attracts hundreds of thousands of visitors a year, and it is a wonderful advertisement for the enlightened approach of Historic Royal Palaces and the creative talents of Todd Longstaffe-Gowan that this palace garden has been so successfully re-imagined in both an historical and a modern context. I never tire of visiting it.